Michelle Chu has had a long career with and within all aspects of the media. Having originally graduated with a Bachelor’s Degree in Electronic Engineering, she soon realised her true passion was with the media. This prompted her to get her Diploma in Television and Radio Broadcasting; followed by a certificate in Computer Graphics Design and Layout. Wanting to broaden her skills, she also obtained a license to be a life insurance and financial consultant. 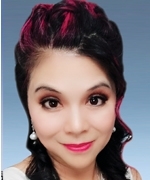 Michelle took her expertise from years of working in the media, first as an anchor for Guang Dong Television, and later, as a program host for the major Chinese TV and Radio Stations in Toronto, as well as an artist for Hong Kong TVB, to the more business-oriented side of the industry. Now, not only does she work as a life insurance and financial consultant, but she also enjoys being a prominent freelance commercial model and producer. In 2003, she founded her own advertising agency – Michelle International Inc., which has been both a successful and rewarding experience. Michelle often contributes to the community by agreeing to emcee and perform for various charity and social functions. By joining the Board of Directors of the RHMCBA, Michelle hopes to further her contributions to the community.